The Three Ridges Trail is a popular loop trail near Cabin Creekwood’s Virginia Cabin Rentals in Lyndhurst, Virginia. The George Washington National Forest hiking trail is a 13 mile moderate trek that takes you by a waterfall. Dogs that are leashed are allowed on this trail. Many have commented that this trail which follows along the Mar har Trail and the Appalachian Trail is not a hiking trail for beginners and actually quite strenuous, so bear this in mind. It actually gains 6,800 feet in elevation change over its long course. It is definitely an all day hike. Along the trail, which is mostly canopied, you’ll be rewarded with several spots with a rewarding panoramic view of the vistas. 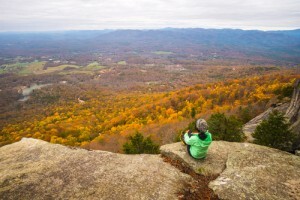 You’ll see The Priest mountain, in Nelson County, Virginia, Spy Rock, Cove Mountain, McAfee Knob, the Grayson Highlands and go over Bee Mountain and Meadow Mountain. Three Ridges Mountain features a view at Hanging Rock Overlook, at Chimney Rock, and a summit overlook. Check out our pet friendly Virginia Cabin rentals conveniently located right near scenic Sherando Lake. We feature well appointed cabins filled with all of the amenities and necessary kitchen items during your stay. We invite you to escape and get away from it all. Our location is actually one place that you can turn your cell phone off and truly unwind. Find out more about fun things to do in the Shenandoah Valley by looking around this website and plan your trip today! We also feature a FREE vacation guide if you just send us your email.